We combined Google Cardboard, Virtual Reality and Augmented Reality. Noticed the colored squares (with rounded corner) – yes they are buttons – try pointing your finger on any of it and notice the TEXT below the interface is identifying which button is selected/pressed. Note: the button will react only if the camera (mobile/tablet) is from around 12 to 20 inches away from the image target. Bonus: Hand tracking (at basic as of the moment) You can tickle the logo – simply poke it and it will move depending on the direction and speed of the tickle/poke. Sorry for coming so late (hehe) – Due to too much activities, we just completed publishing CLSU 3D virtual tour ANDROID App in GOOGLE PLAY STORE. Please support this voluntary project 🙂 – Yah, PAID APP for awhile, but once we raised the required amount for the expenses of the development, we will set it to FREE APP. Again, spearheading another big event on our area. 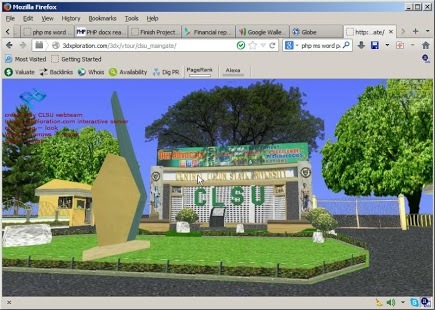 The CLSU webteam with the help of team artsdigitalmedia.com [headed by artpologabriel & dexter jay bago] created the virtual tour for Central Luzon State University, this is just the beginning of their task to completely capture the entire CLSU campus in 3d interactive interface. Upon winning the ESIHAS Best Website last year, the CLSU web team is even more eager to provide further and better web services and interface. The virtual tour interface is hosted at 3dxploration.com server which is designed for 3d interactive features and server load. We are hoping that everyone from CLSU supports the CLSU website and its interfaces. Website of the Technology Business Incubator at CLSU Philippines. The website is now online (but we are still working on the design).